Your toilet bowl is in touch with water which contains different types of minerals. These minerals lead to limescale residue which can be quite ugly. Here are a few tips on how to clean limescale from toilet bowl. You will also find reviews of the best limescale removing products, such as the Bio-Clean, you can get from Amazon today! 1 What causes limescale build-up in toilet bowls? 2 Where are limescale deposits more likely to occur? 4 How to clean limescale with a pumice stone? What causes limescale build-up in toilet bowls? So why does limescale occur? Well, the toilet bowl contains a certain amount of water in it at all times. This water is full of minerals like calcium. Over a while, the calcium deposits start to build up, causing those yellowish, orange or sometimes even brown rings around your toilet bowl. Where are limescale deposits more likely to occur? If your home is supplied with hard water, limescale deposits are more likely to occur just because hard water contains a more substantial amount of minerals and lime. However, limescale deposits can occur in any home, even outside of the toilet bowls. While this limescale will not affect your plumbing, it can certainly be unsightly and ruin the look of your otherwise pristine looking toilet bowl. There are several natural homemade remedies you can use. Remember always to wear protective gloves during this process to maintain hygiene and be safe. Turn off the water supply to your toilet, and flush your toilet to decrease the water level. This will expose the limescale on the toilet bowl and make it easier for you to clean. You can even use a plunger to drain more of the toilet water and expose the limescale which can be hidden even lower. Vinegar is an excellent solution for cleaning limescale, as it is acidic, and thus works on the stains by penetrating them and removing them off the surface of your toilet bowl. You can create a solution out of white vinegar and water and spray this on the problem areas in your toilet bowl, or you can pour some pure vinegar down your toilet bowl and allow it to rest undisturbed for a few hours. Now, using a toilet brush, scrub the inside of the toilet bowl to remove the limescale stains. Typically, most of the stains will vanish without an issue. However, if there are still residual stains, you can add some baking soda to your toilet brush and use this to scrub the limescale deposits once again. Turn the water supply back on and flush the toilet to reveal a clean and stainless toilet bowl! How to clean limescale with a pumice stone? A pumice stone can do wonders in cleaning limescale residue from your toilet bowl. Gently scrub the inside of your toilet bowl with a pumice stone you can buy on Amazon and some warm water. However, be gentle on the bowl, as you don’t want to leave scratch marks! Just like any other deposit, if you have allowed limescale to sit for too long, there is a chance that these natural remedies will not work. However, you can always use commercial cleaners to get the job done. Here are four best, time tested products you can use. 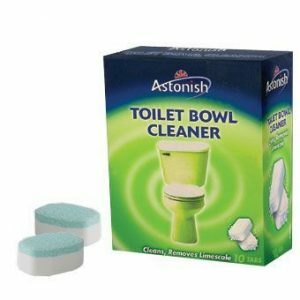 Astonish limescale cleaner is a specially formulated product to remove limescale and make your toilet smell fresh and clean. Sometimes for very stubborn stains, you may have to scrub a bit. The Astonish limescale cleaner does its job perfectly. It is on par with the best products for this issue. We recommended to keep the product for 10-20 minutes; however, for tougher stains, you can even use 2 packets, or keep the product overnight to remove all stains. Click here to check the current price on Amazon. 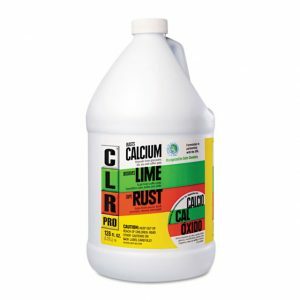 A patented solution for cleaning limescale, rust and other deposits effectively from your toilet bowl, CLR Pro works on all kinds of surfaces to give you the cleanest toilet bowl for your home. It is essential always to use rubber gloves and an eye mask when working with CLR Pro, as this will ensure that you are safe while working wonders on your toilet bowl. Click here to check the current price on Amazon. Are you looking for an environmentally safe product to remove limescale? Do it with Bio-Clean, a professional limescale cleaner for your toilet bowl! 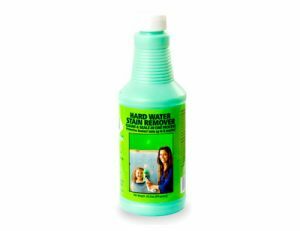 A completely non-toxic, eco-friendly limescale cleaner. However, if you use the solution with a manual or automatic brush, it can be easier to remove tougher stains. Click here to check the current price on Amazon. Looking for a super-strong cleaner to take all your limescale-deposits away? Lime-A-Way certainly lives up to its name! Works on toughest stains within seconds! For the fastest working, non-scrub solution. 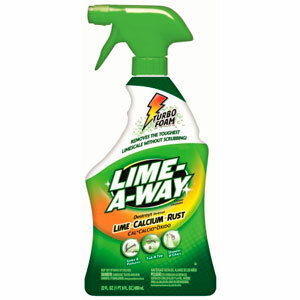 Just like any other cleaner, Lime-A-Way has a slight chemical odor; however, use a mask and rubber gloves while using the product so that you are not affected by the cleaner! Click here to check the current price on Amazon. Take some undiluted white vinegar and pour it directly into your toilet bowl. Make sure to pour the vinegar down the sides of the toilet as well. Let this sit undisturbed for about 4 hours. Take a toilet brush and add some more undiluted white vinegar to the rim of the toilet bowl as well. Start scrubbing the toilet bowl and the side. Be sure to apply pressure and rub in circular motions firmly, so that you can remove all of the limescale from the toilet rim. Flush the toilet to remove the limescale as well as the vinegar. You can also add some toilet cleaner to the rim of your toilet and allow it to sit for a while, before scrubbing it again and flushing the toilet. Be sure to keep your bathroom well ventilated during this process so that the strong smells do not irritate you. You will need to purchase two types of sandpaper, medium grain sandpaper, and fine grain sandpaper. Each of these types of sandpaper will help you remove the stubborn limescale from your toilet bowl. Start with the medium grain sandpaper by gently rubbing it along the rim and bowl of your toilet. Make sure that you are wearing protective gloves while doing this. Be careful to not rub the sandpaper too hard on your toilet bowl, as this may leave scratch marks. Instead, use a gentler approach while scrubbing your toilet bowl with the sandpaper. Next, you should take the fine grain sandpaper. While the medium grain sandpaper will remove most of the stubborn stains and limescale from your toilet bowl, the fine grain sandpaper helps to concentrate on the details, removing the fine particles of limescale as a finish. Flush the toilet to remove the limescale from the bowl. Take some toilet cleaner and pour it down the toilet bowl. Allow it to sit undisturbed for a while. Take a toilet brush and gently scrub the toilet bowl to clean it thoroughly and remove any remaining limescale from the bowl. If any limescale persists, you can pour some undiluted white vinegar down the toilet bowl and allow it to sit for about 3 hours. Then, using your toilet brush, scrub the toilet bowl once again. Flush the toilet and wash away all the remaining limescale from your toilet bowl. Take one cup of undiluted white vinegar and pour it into your toilet bowl. Allow it to sit for a few minutes undisturbed. Take a toilet brush and gently scrub your toilet bowl and the rim of your toilet. Take one cup of baking soda and add this to your toilet bowl. The baking soda acts as a mild abrasive to work on the brown limescale stains and obliterate them. Add another 2 cups of vinegar to the toilet bowl. It will cause an immediate fizzing action in your toilet bowl. However, this is entirely natural. Let this solution sit undisturbed for about 10 minutes. Take your toilet brush once again and start gently scrubbing the toilet, making sure that you bring the solution upwards above the water line, targeting any limescale marks and stains all around your toilet bowl. Let this solution sit for another 30 minutes. You can use the toilet brush in 10 or 15-minute intervals to really get the solution to the brown limescale marks and to scrub them off gently during this process. Flush the toilet after 30 minutes to remove all the brown limescale from your toilet bowl. The area below the waterline on your toilet bowl is the place which is the most affected by limescale. It is because this area is exposed to hard water, which is full of minerals. Due to constant exposure, the hard water build up can become quite stubborn, and the area can look very dirty. Take some undiluted white vinegar (about 1 or 2 cups) and add it into the water bowl of your toilet. Allow it to sit undisturbed for about 3 to 4 hours. Add a cup of baking soda to the toilet bowl and let it sit for 10 minutes. Take your toilet brush and scrub the toilet bowl well. Allow it to sit undisturbed again for a few minutes. Flush your toilet and wash away all the vinegar and baking soda solution. If you find any limescale marks persisting, you can add a regular toilet cleaner to your toilet bowl. Once again, allow it to sit undisturbed for a while. Retaking your brush, scrub the bowl gently but be careful not to be too harsh on the toilet bowl. Let it sit for 5 minutes before flushing the toilet, removing all the limescale from below the waterline in your toilet. Limescale residue can form in any toilet bowl and can be extremely unsightly. However, by regularly cleaning your toilet bowl with natural products such as lime, vinegar, and baking soda, you can prevent limescale from recurring. Treating the limescale at the earliest will ensure that the stains are easier to remove. You can also read how to remove limescale from the dishwasher and from the shower head. I agree on the “too much options out there” but customers review is there to guide you. For us the past experience of the customers says it all. One of the best things if you buy stuff online. The first time we moved into our house I couldn’t figure out what that ring was around in the toilet. I called my mom and she said to buy a stone to scrub it off. It works so good! Which reminds me, I need to buy another one, the rings are coming back lol. The stone works really well. When I first heard that you can do it with a stone, I was afraid from scratches. But everything turned out fine. Great research and perfect tools for bathroom cleaning. As a general public, I truly said that there is an excellent explanation for toilet materials guideline. Useful tips and tricks. Thanks a lot for sharing this informative post. How can I remove bathroom sink dirtiness, mildew with natural away? I am used to cleaning my bathroom lemon juice and citric acid. You have shared great products and information to get rid off lime line from toilet bowls. I usually try vinegar, baking soda, and stiff brush to clean my bathrooms. Thanks for sharing this cleaning material, nice job.